Greetings one and all! I hope you are doing well and loving life. Once again, I invite you to take a deep breath, pour a cup of coffee or hot tea, and relax. RELAX. Easier said than done, right? If you are currently a caregiver, there is no lack of stress in your life. Caring for family members or friends can be (and usually is) physically, emotionally, financially, spiritually, and psychosocially stressful. “Relaxing” rarely makes it on the list of things to do for most caregivers. So, instead of dancing around the issue of stress and hoping things will get better, let’s spend some time today stressing stress. What do I mean by stress? Stress is our response to a destabilizing force in life. Anything that upsets the tenuous equilibrium of life is therefore perceived as stressful. Perhaps an image would be helpful. Imagine enjoying a lovely day on your pond of tranquility. Calm breezes. Smooth waters. Blue skies and sunshine. All is well. And then, a huge boulder falls unexpectedly into your pond. WHAM! Your world is now rocking and rolling. Smooth sailing is a thing of the past—a distant memory. Today, you must figure out how to ride the waves. Stressful? Absolutely! I think it’s fair to say that illness and aging often qualify as “boulders” in life—sources of stress, wave generators. This past week as I watched a poignant PBS documentary, I once again marveled at how families manage to deal with the ripple effects of caregiving. Caring for Mom and Dad doesn’t sugar coat the experience of family caregivers. The documentary depicts the journey realistically and respectfully. The caregivers interviewed were committed to caring for their loved ones, often sacrificing their own health and well-being in the process. The families discussed the devastating financial costs of care as well as other noteworthy costs: strained sibling relationships, divorce, physical and emotional distress, employment concerns, and role changes. Each family shared a unique story of caregiving. However, every family struggled with the universal stresses of caregiving. Stress and caregiving go hand-in-hand. Common ground. Common concerns. Common cause. The PBS documentary serves as a call to action for individuals and families. Caregiving is stressful—that’s the reality. Furthermore, stress is magnified due to poor planning and lack of resources. So, if we are to care well for others and have others care well for us, we must plan well. Granted, we can’t anticipate every twist and turn in life. We aren’t clairvoyant! But there are “knowns” in life. As human beings, we need to acknowledge our finitude and plan for our eventual decline and demise. Before a health care crisis drops into your pond of tranquility, discuss the various aspects of caregiving with your family and friends—who, what, when, where, why, and how. By so doing, you can work together to manage and to mitigate the stresses associated with caring for each other. Being realistic about the journey of caregiving and being well prepared enables us to maintain a balance between the burdens and the blessings of caring for our loved ones. 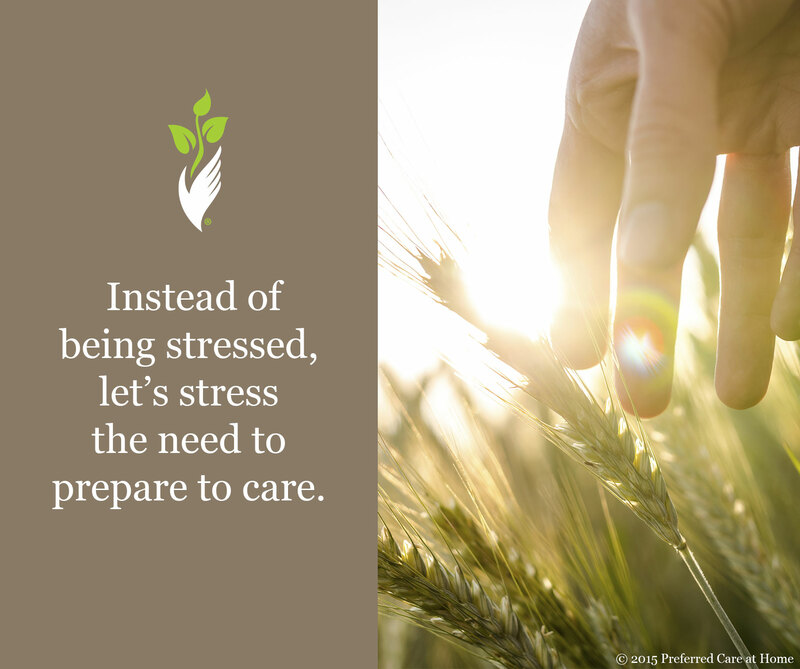 So, instead of being stressed, let’s stress the need to prepare to care!